Supreme Court, in Baldev Singh Vs State of Haryana, held that evidence of police witnesses cannot be discarded merely on the ground that they belong to police force and interested in the investigation and their desire to see the success of the case. This observation was made by Apex Court bench of Justices Jagdish Singh Kehar and R.Banumathi while dismissing the appeal filed by a person, against the High Court Judgment which had reversed the order of acquittal by trial court. Supreme Court held that no witness examination is permissible, within the parameters of Sections 30 and 33 of the Arbitration Act, to prove a legal misconduct on the part of the arbitrator. Supreme Court held that a limited interest created in whatever form, in favour of widow who was having a pre-existing right of maintenance becomes an absolute right by the operation of Section 14(1) of the Hindu Succession Act. Apex Court bench comprising of Justices M.Y. Eqbal and C. Nagappan dismissed an appeal and upheld the view adopted by High Court regarding Section 14 of the Hindu Succession Act. Supreme Court of India held that ‘Fee Continuity benefits” must not be confined to conversions taking place after a particular date, as no such date finds mention in the regulation. Apex Court bench of Justices VikramjitSen and Shiva Keerti Singh dismissed an appeal filed by Securities & Exchange Board of India, against the order of Securities Appellate Tribunal (SAT) in appeals filed by the stock brokers to challenge the action of SEBI denying them the benefit of fee continuity in terms of paragraph 4 of Schedule III to the Securities & Exchange Board of India (Stock Brokers and Sub-Brokers) Regulations, 1992. The Supreme Court of India on Thursday, dismissed a batch of appeals filed by All Kerala Online Lottery Dealers Association and other Online Lottery dealers against the Division bench Judgment of Kerala High court which had upheld the Government notification banning Online Lotteries in the state. A Three Judge bench of the Apex Court comprising of Chief Justice H.L. Dattu, Justices R.K. Agrawal and Arun Mishra held that the Government of Kerala was well within its rights to prohibit the sale of online or internet lotteries in its State. In Civil Appeals preferred against the common judgment of Madras High Court in a matter pertaining to cancellation of admission to MBBS course by a college without fault on the part of candidates, the Supreme Court Division Bench comprising of Justices C. Nagappan and M.Y. Eqbal held that the aggrieved candidates can be awarded compensation, but not granted admission. Amidst complaints of irregularities in the results of Delhi Judicial Services Exam 2014, the Supreme Court on Monday, said it will appoint a retired judge of the apex court to re-evaluate the answer sheets. The Supreme Court which quashed the act envisaged to set up National Judicial Appointments Commission finding it “unconstitutional” and an “affront on independence of judiciary” on Tuesday, initiated steps to infuse more transparency in the functioning of the collegium system which it had promised. 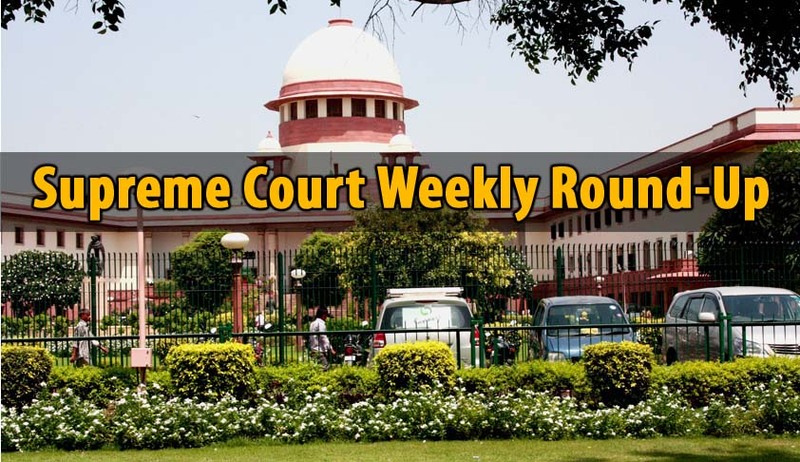 The supreme court on Monday, pulled up the centre and issued notice to it for improper implementation of MGNREGA in terms of timely payment of wages, compensation, unemployment allowance, and for pending liabilities. The Tamil Nadu government on Monday filed a petition in the Supreme Court challenging High Court’s orders to deploy Central Industrial Security Force (CISF) for manning the High Court premises in both Chennai and Madurai. The Supreme Court on Tuesday dismissed DravidaMunnetraKazhagam (DMK) MP Kanimozhi’s plea to quash charges framed against her in the 2G case after keeping it pending for over two and a half years. Raising serious concern over the violence indulged in by lawyers in the Madras High Court premises, the Supreme Court on Wednesday, refused to interfere with HC’s order for deployment of CISF by replacing state police security in the court complex. In a sudden decision after a 45 minute hearing, a supreme court bench on Wednesdat, referred the plea of Patel quota leader Hardik Patel challenging the invocation of sedition charge against him by Gujarat Police for allegedly inciting a fellow activist to ‘beat up or kill’ Gujarat police men instead of committing suicide, to another bench. The Supreme Court on Thursday, began attempts to improve the collegium system, where judges themselves appointed judges and is often criticized for being shrouded in secrecy and over-confidentiality, by considering suggestions forwarded by several legal luminaries, former judges and the government. In a setback to Chief Minister Virbhadra Singh, the Supreme Court on Thursday, transferred from Himachal Pradesh High Court to Delhi High Court a plea filed by him in a disproportionate assets case. The probe into irregularities in the Delhi Judicial Services (Mains) exam 2014 took an altogether new twist with the Supreme Court making it clear that it would like to hear 15 successful candidates before appointing a retired judge of the apex court to revalue papers. A bench of Justice Dipak Misra and Justice Prafullah C Pant issued notices to the 15 candidates through the Registrar General of the Delhi High Court. The CBI and victims association on Friday, moved the Supreme Court against the “shocking” August 19 decision of the court to let off theatre owners Gopal and SushilAnsal, convicted in the 1997 Uphaar cinema fire tragedy which claimed 59 lives, after considering the period they had already undergone in the prison as their sentence and imposing a fine of Rs 30 crore each. Patidhar agitation leader Hardik Patel suffered a major setback when the Supreme Court on Friday, refused him bail and asked the Gujarat police to complete probe in a sedition case against him within 45 days.